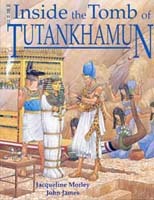 This story takes you to the ancient kingdom of Egypt. Kings had ruled there since before 3000BC. The Ancient Egyptian term for 'king' was 'pharaoh'. The pharaohs of Egypt had great power, for their people believed them to be gods on earth. In 1333BC a boy aged about nine became pharaoh, but he did not rule for long. Today, however, he is the most famous of all the pharaohs. Many people who know nothing else about Ancient Egyptian history know his name.